In 2016, gross sales under banner recorded growth of 26.3% in local currency, to EUR3.736bn. In turn, in the last quarter of the year, gross sales under banner reached EUR1.039bn, representing growth of 7.4% at constant currency and 23.8% in local currency. Comparable sales in 2016 improved by 19.1% (excluding the positive calendar effect of 0.3%), while the improvement was 18.1% in the fourth quarter, with a positive calendar effect of 0.3%. Thanks to the appreciation of the Brazilian Real against the euro at the end of 2016, the negative effect of currency in the growth of gross sales under banner decreased significantly in the fourth quarter, to 16.5% from the 28.3% accumulated during the entire financial year. In 2016, the negative impact of the Brazilian Real on sales was 5.1%. DIA China maintained positive growth in the last quarter of 2016, with a solid annual improvement of 3.4% in comparable sales (excluding the positive calendar effect of 0.3%). Net sales increased 25.7% in local currency, but decreased by 1.5% in euros to EUR3.122bn due to the depreciation of the currency during the year (-4.8% for the Brazilian Real, -37.4% the Argentine Peso and -5.2% the Chinese Yuan). In the fourth quarter of 2016, net sales jumped by 22.5% in local currency, thanks to the appreciation of the Brazilian Real in the last quarter, while net sales rose by 8.0% in euros to EUR865m. Adjusted EBITDA climbed by 41.9% at constant currency and 7.3% in euros to EUR117.1m, with an improvement in margins of 31 basis points to 3.8%. Depreciation and amortization rose by 24.4% in the fourth quarter of 2016 to EUR15.2m euros and 9.4% in 2016 to EUR54m, due to the greater investment activity carried out over the last few years. In the last quarter of 2016, adjusted EBITDA increased 63.4% at constant currency and 22.0% in euros to EUR33.7m. This performance was reflected on an annual basis in an improvement of 5.6% in euros to EUR63.1m (+49.7% at constant currency). The adjusted EBIT margin expanded by 45 and 14 basis points in the fourth quarter and in 2016, respectively, representing 2% on sales at the end of the year. In spite of the complex scenarios in the emerging markets in which DIA operates, the company posted outstanding operating results during the financial year. 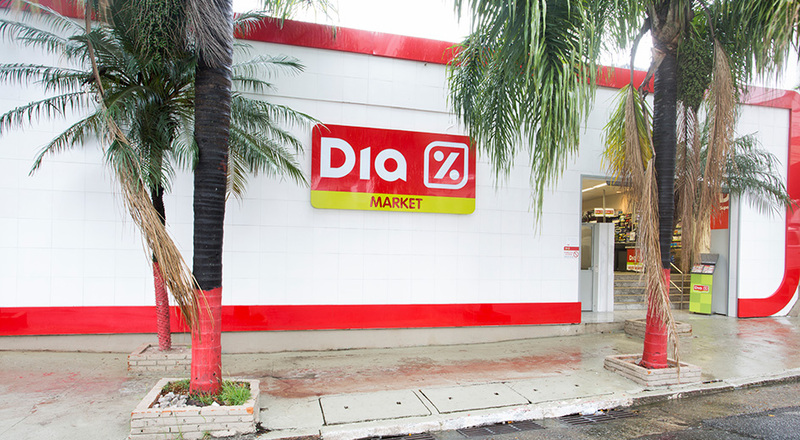 Market shares in Brazil and Argentina continue to climb, the commercial offering has improved in all countries, and own-label products continue to increase their offer and penetration in the total number of SKUs, while the Club DIA loyalty programme is fully implemented in the state of Sao Paulo.